According to the victim Kirshenzaft was captured on surveillance video breaking into his room a number of times and making off with his Tefillin and other valuable items. The victim approached the Hanhalah, namely Rabbi Shlomo Zarchi, informing him of the theft. 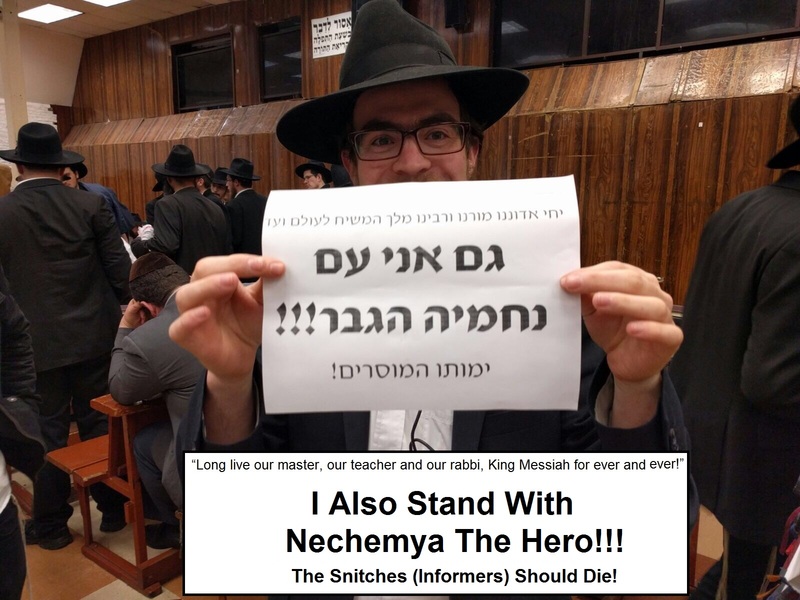 Asking if he had any proof, Zarchi was shown the surveillance video he immediately summoned Kirshenzaft and gave him an ultimatum, return the items you stole and you will be permitted to remain in Yeshiva. Instead, Kirshenzaft repeatedly denied that he was the thief or that he ever entered the room – and ultimately not returning any of the stolen items. 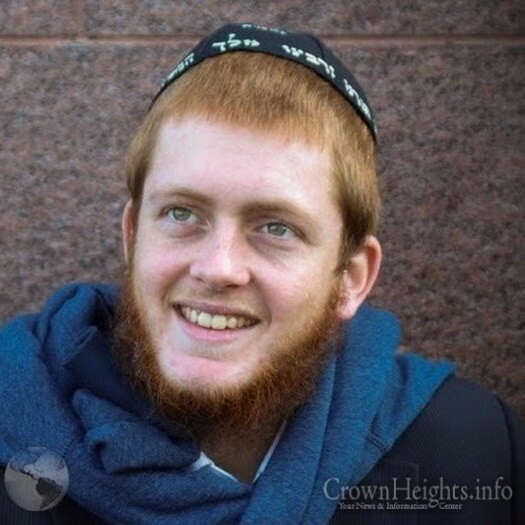 Speaking with CrownHeights.info Rabbi Moshe Meir Gluckowsky said that Kirshenzaft arrived in the United States before Tishrei and was enrolled as a student in Kvutzeh and he was given a room in the 1414 President Street dorm. 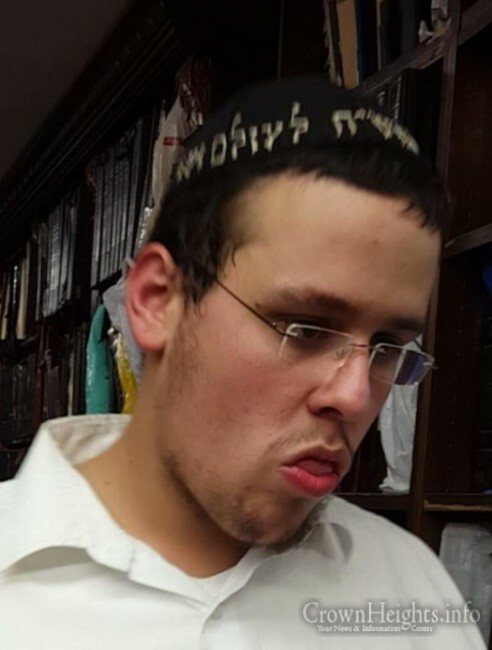 Once the Hanholo was informed of his involvement in the robberies and the beating he was immediately expelled from yeshiva and his I-20 student visa was terminated. Gluckowsky said that he was also expelled from the 1414 dorm and moved into 749. 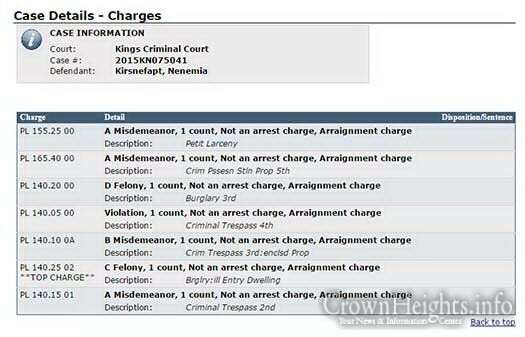 At the scene of the arrest on Kingston Avenue, many of Kirshenzaft’s friends swarmed the cops and shouted “Informer! Informer!” at the victim, who was present for the identification. 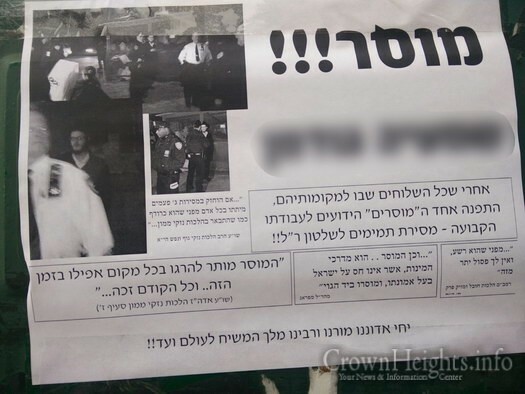 The following morning signs with pictures of the victim were hung up around Crown Heights calling for the victim to be killed. The campaign of threats and intimidation did not end there. 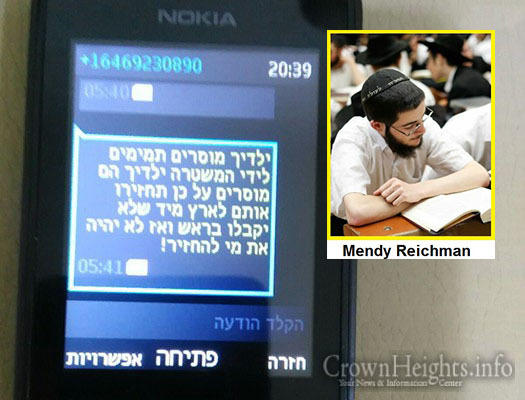 The victim’s parents, who are Shluchim in Israel, received threatening text messages and phone calls. “Your children are informing on Temimim… return them to Israel immediately or they will receive [bullets] in their head and you won’t have who to return” read one of the messages sent to the victim’s mother. “Your son is in danger. It is worth it for you to calm him down” read another sent to his father. The brother-in-law of the victim also received a phone call in Israel, “one of your children will be struck by a car today. One of your kids will not come home” the caller said, then hung up. 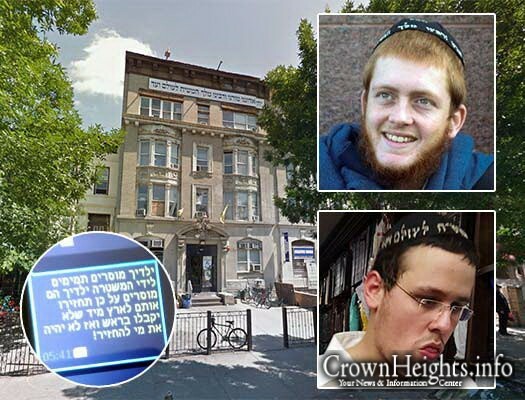 The following day, Wednesday, 20-year-old Moshe Halperin, an Israeli man, was taken into custody on in front of 770 Eastern Parkway and was charged with same charges as Kirshenzaft, stemming from his alleged involvement in the same burglaries. 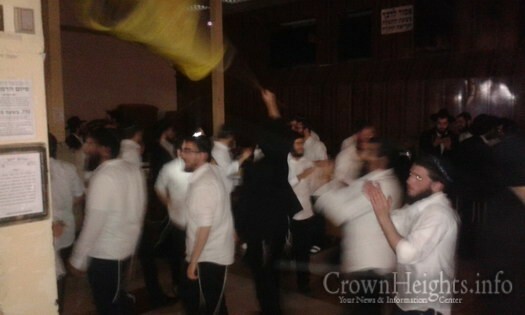 The arrest came as friends of his were inside 770 celebrating the release of Kirshenzaft with loud music and dancing. 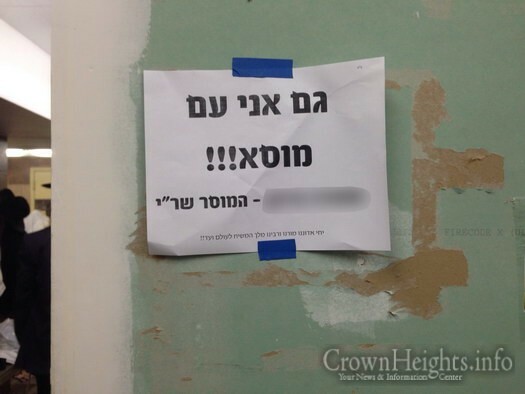 A Shiur in Inyonei Geulah U’moshiach, which was established by Kvutzeh Bochurim in memory of the Shliach Rabbi Aron Leizer Ceitlin OBM, was going on at time and was disrupted by ‘celebrations’. 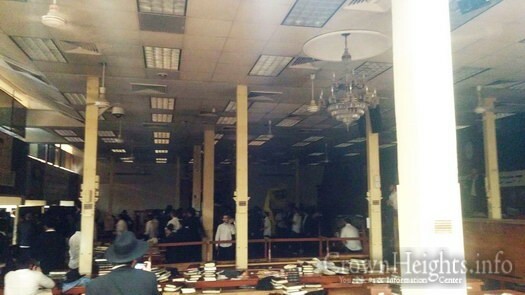 When their loud music and dancing did not end the Shiur, the celebrators resorted to throwing eggs and shutting off the lights. Halperin was held overnight and was released late Thursday evening. 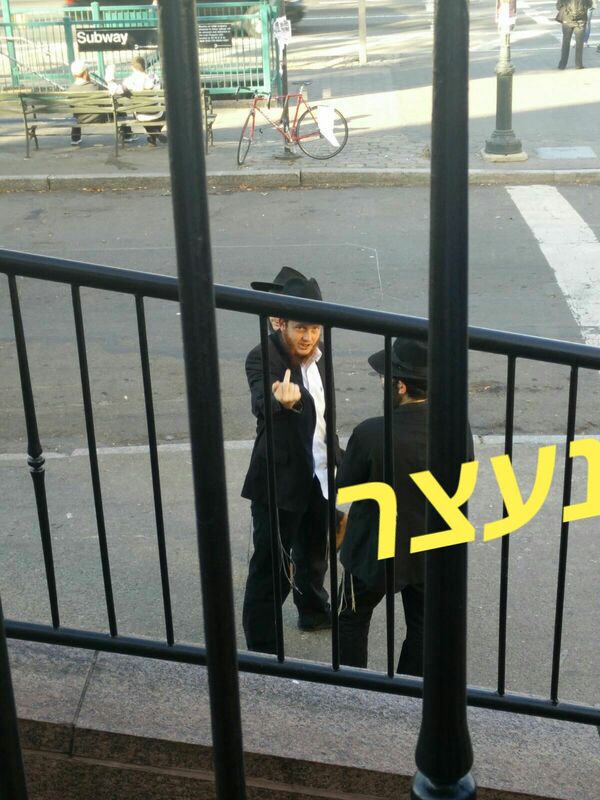 Halperin is also accused of vandalizing the Kehot display case outside the Rebbe’s Room. The case was defaced with yellow graffiti sprayed over the glass and the Kehot logo. 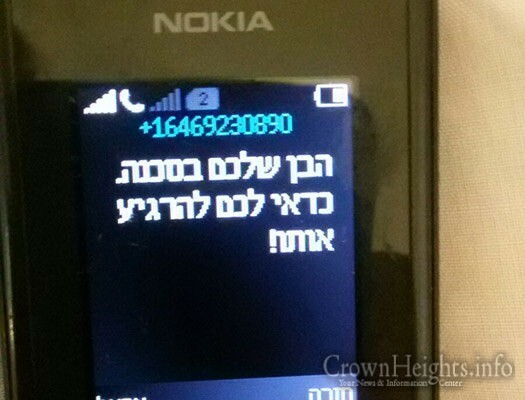 Threatening text message sent to the victims mother: “Your children are informing on Temimim… return them to Israel immediately or they will receive [bullets] in their head and you won’t have who to return”. Sent by Mendy Reichman. 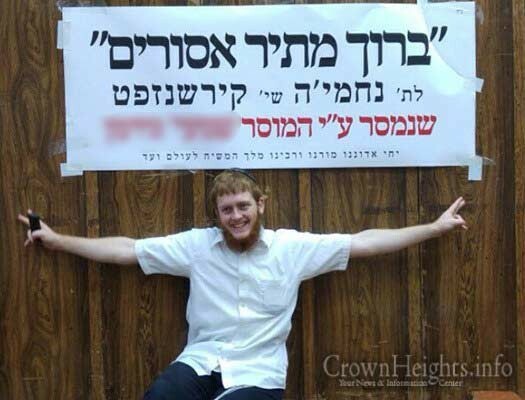 Nechemia Kirshenzaft posing in front of a sign celebrating his release. Celebrating the release of Nechemia Kirshenzaft, while disrupting an ongoing Shiur. 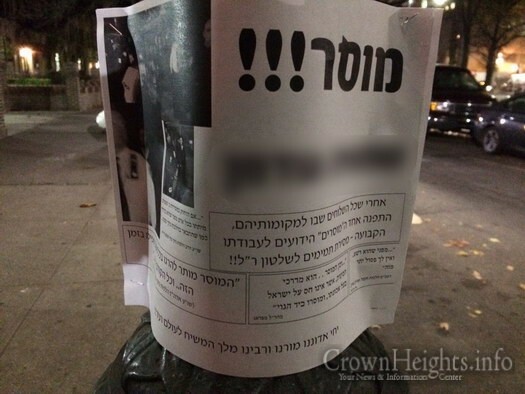 Signs calling for the “killing of the informer” that were hung up all around Crown Heights. Also, who bailed them out? 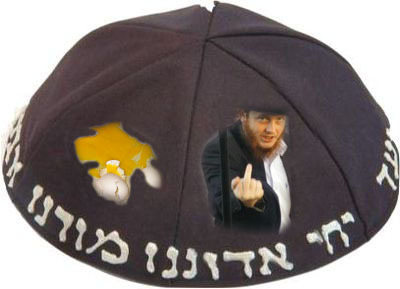 This entry was posted on November 22, 2015 at 1:04 pm and is filed under In The News, Mishichistim Mossrim. You can follow any responses to this entry through the RSS 2.0 feed. You can leave a response, or trackback from your own site.